"[W]e aim to release the first builds of Blue Mars on iOS next month," the announcement on the Blue Mars blog states. "The focus for the first version of Blue Mars Mobile is avatar style and rankings." The PC version will continue to exist, but likely won't be updated besides bug fixes; however, current Blue Mars City developers no longer have to pay monthly hosting services. Read more here from Avatar Reality CEO Jim Sink, who as part of the restructuring, is leaving the company. However, he will still be appearing in Blue Mars to talk about the world's future today at 5pm. As regular NWN readers know, Iris Ophelia and myself were consultants with Avatar for a few months last year, but not at the moment. We'll let you know if that changes. In any case, I'm very interested to see how Blue Mars Mobile develops -- unless I missed an earlier launch, it looks like it'll be the first 3D virtual world for the iPad. Anyway, for more info, join Jim in Blue Mars' Welcome Area in about half an hour. I'm sad about this. It clearly spells the end of Blue Mars as a VW and the failure of the CEO to make it achieve a position in that market. I also feel sorry for all those that were drawn into learning, making and selling in Blue Mars. The platform had potential but sadly that always remained unrealised. This is a desperate last gasp by the company to head into the mobile space that in the next 12 months will be filled with more attractive offerings. I wouldn't make that conclusion just yet, Hitomi, stay turned for updates. I never left Second Life, John, SL was a major focus of this blog even when I was consulting for AR, and barring the unexpected, it will continue to be so. This makes me terribly sad. Blue Mars was never developed to the point of making it truly interactive and community friendly. Avatar customization is a first step, not an end unto itself. I would be on IMVU if it was! I am really curious if they intend to let all that potential sit fallow? They have a half-developed VW with HUGE potential that still needs to have vehicles, interiors, and the ability to share content - hell maybe even some tools to create it! That must have some value? Another desktop 3D VW is taken down by that Champeen and Queen of Desktop 3D Virtual Worlds...Secoooooooond Liiiiiiife. Now they're just simply regurgitating the newest popular buzzwords "mobile i-App" how feasible that Kinect-BM connection you dream about is going to be now? Maybe they could have done better if they had released a Linux client to get more Linux-y early adopters. Or if they'd had focused on having good communication tools right in the client like "Groups". Flash based HUDS for everything, what kind of silly idea was that. My last venture into BM really wasn't that bad, really. Realized they were going for a "We're Sony's Home for the PC....we don't make content others will." But that wasn't really working was it, because they needed content (and those Flash HUDS they were saying were to future) to show off to prospective clients. I wouldn't be surprised if Caledonia has/had the highest user numbers due to the Guvnah's fans and large number of SL Caledon early adopter types. For all intensive purposes, Blue Mars is now out of the large scale pc-centric Virtual World business. Stopping development on a platform cannot be sugar-coated. This announcement did not have to be negative. The new Blue Mars (Blue Mars mobile) will be browser-based, with a very lightweight client. What they could have said -- and did not -- is that Blue Mars will now focus work exclusively on a browser-based application (much like Second Life did in mid 2010 to explain a similar diversion of resources in laying off staff). Instead, Avatar Reality wishes it to be known that they are finished with trying to support, market, and develop a virtual world that is way ahead of its time in consumer and organizational acceptability. It is obvious from the announcement that they were losing cash at a very rapid rate. The real reason for this announcement is that Blue Mars has not yet earned substantial payback for the large investment that was made in a highly advanced platform. It is very hard to gain investment capital now for any Virtual World application due to the the failure of first - generation entrants (with the exception of Second Life) to earn substantial income. In addition, Blue Mars is empty. I put the number of repeat users at under 5,000. I am a heavy user (I love the imaging), and I rarely see anyone in there outside of three or four "regulars". It would take a huge amount of content and activity investment for Blue Mars to come anywhere near what Second Life has to offer. I do not think any major organization, and many were considering doing so, will now enter the current Blue Mars platform. I am not sure that they can be convinced to buy off on the new mobile application. Blue Mars has been very successful in gaining a handful of high-quality developments for universities as test beds which are now operational -- including IDIA labs from Ball State Univeristy and the OnLand development from Tesside University, all of which must be considering the efficacy of future investments based on today's announcement. What does this mean for Linden Labs and Second Life? The Virtual World market is Second Life's right now. They will not have a graphically rich competitor breathing down their necks for crucial institutional, educational, and mainstream business investments. If Linden Labs, parents of Second Life can gain the business that is now evaluating Blue Mars, which includes according to some reports the huge U.S. Smithsonian Institution, they can regain momentum in the virtual world arena. It is also clear the Linden Lab's initial business model for Second Life -- let the users handle development, keep things as open as possible in terms of building and scripting, and minimal if any enforcement of internal content -- actually makes sense considering that large-scale professional content development, sales, and maintenance is very expensive. Whether or not they can become a serious commercial or educational platform is still to be decided, but doubtful given Second Life's current rendition. I feel like something crucial is missing from this. What exactly is meant by no longer charging for the City Developers? Are the actual worlds just going away? Is there anything about this that is still a 3D virtual world? It's really unclear. Although that's not new with Blue Mars - I'm unclear if they ever fully implemented the service to begin with. I went into Blue Mars maybe a dozen times, and sure the eye candy was impressive, but the closest I came to contact with another person was seeing 1 other person running across a plaza, that was it. BM is betting low power tiny screen crappy hand-helds with high monthly fees. Hopefully the consumers will reject this idea and those companies and ISPs die off. BM didn't really appear to have much of a revenue model. I suspect, based on early ads, they were hoping for a lot of edu and corporate sponsorships that never materialized. But I bet the company officers took a lot of investor cash home. Want to get rich? Get venture capital. BM always had the right initials (Bowel Movement). Never liked it... tried it a half dozen times. Can't say I much like SL either these days. There was no mac client so i never saw Blue mars for myself. How does content get created for the place? is it with the pc browser thats no longer being updated? I will be interested to see how Blue Mars works on my ipad. Im sure LL will watch with interest also. If i Was LL which im obviously not, i would consider doing a mobile version of SL that only represented Second life rather than have every large textured detail. maybe even having a mobile version of your avatar specifically created to represent your mobile self. Basic set of features for communicating with friends, checking notices and profiles. Experiencing second life has many many levels, some of which will not be effective on a small mobile device. A mobile version should be optimised for the sorts of tasks people will find most comfortable doing on a mobile device. There was no mac client so i never saw Blue mars for myself. And that is why they failed. Say what you will about SL, at least they acknowledge that not everybody does Windows. Yes, I suppose I could have used Boot Camp in theory but I've never bothered to for anything else and it didn't seem worth the hassle to learn just to sign up for another virtual world when I already have one to spend my time in. Twice over. To all future would-be SL competitors--be sure to have Mac and Linux clients available if you want to tap into the ENTIRE virtual world market. the great irony is that "all that detailed" rendering power of the crytek engine, etc etc. will all be basically un-needed for the level of detail and presentations that will prove most "successful" as interfaces on the smaller screens of mobile devices. anyhow, same old story for fame and glory. Blue Mars was boring and this will serve to make it more boring. Perhaps Microsoft will buy it and use the tech in Xbox, but otherwise, BM is dead. Blue Mars makes their first mistake... oy. Not further developing the PC version? HELLO? "[Second Life] will not have a graphically rich competitor breathing down their necks for crucial institutional, educational, and mainstream business investments." The only educational initiative in Blue Mars I knew about was a group from Ball State. I'd have liked to seen their build. Perhaps with this new client I can. As for SL, though many of us are moving to OpenSim grids, SL still works great for meetings with 40+ educators. And lots of folks, unlike me, are not so grumpy. They are sticking around SL for now. "Another desktop 3D VW is taken down by that Champeen and Queen of Desktop 3D Virtual Worlds...Secoooooooond Liiiiiiife." CronoCloud, this kind of triumphalism might be understandable if Second Life was still growing, but the painful fact is SL has been slowly but steadily losing active users and active user hours over the last three years. The reality is that the total market for 3D virtual worlds is shrinking, not growing. Indeed, that's one of the main reasons I wanted to consult for Avatar Reality -- Jim had really good plans for expanding the market, some of which you saw, like the first cloud deployment of a 3D world, and some of which haven't come to fruition yet. Hopefully they will in the future of Avatar Reality; iOS deployment is a good idea and may expand the total market, because there's not really any 3D virtual worlds on the iPad that I'm aware of. Avatar Kinect and various spinoffs may also grow the total market, which is why I'm excited about those; same with web-based 3D worlds and technology like OurBricks and KataSpace. Not everyone likes these kinds of deployments; some of them aren't to my personal taste as a user. However, it is absolutely crucial for the future of Second Life that the total market for 3D worlds grow, and since SL is not growing now, I'll continue to hope other technologies and platforms can do so. Perhaps I'm an old fogey (fogette? ), but the notion of confining a huge 3D virtual world into the pitifully small screen of an iWhatever makes no sense to me, any more than using such a device to watch videos or TV. It feels like Plato's cave 2.0. If you look at the raw figures, yes it has. I think that has more to so with the crackdown on bots over that period. If you look at number of logins (a better figure as bots don't usually login again until they crash) that peaked in early 2010 and even now after all the Viewer 2/Emerald drama it is still at 2009 levels. That is not saying that SL does not need to go after different markets as it certainly will have to, and with recent developments it will become possible to run a paired down SL on tablets, just as it is already on netbooks. Can you really say that running a Crytek engine base on iOS is the best way to make a dress-up game? And do you think that the investment capital will even give it enough time to try? Other competitors will be there faster and with more suitable technology - sadly this is the end for the Blue Mars VW. It's really a pity to see yet another virtual world failing, but... it's not really a surprise. 18 months later, 3500 registered users (on the forums), and possibly no VC money left, it was time to evaluate if the business model was really suited to pay for the recurring costs on further development and server maintenance. I guess that being the first 3D user-generated-content, social virtual world on the iPhone might be an interesting market; after all, IMVU's own offerings for iOS are not 3D. And Hamlet, "Second Life" as the product of Linden Lab might not be growing, but "Second Life" as the concept, the technology, the platform is growing like crazy — it just happens that the growth is happening outside Linden Lab on OpenSim grids. No, it's not exponential; but I'd be very surprised if in 5 years there are still any universities left without a SL-compatible experience. There are not many left right now. They're just not paying LL, that's all. Hamlet wrote: "this kind of triumphalism might be understandable if Second Life was still growing, but the painful fact is SL has been slowly but steadily losing active users and active user hours over the last three years. " It's not triumphalism at all, Hamlet. It's just the truth of the matter. As much as we SL users complain about the faults of SL...it's still head and shoulders above anything else. Any VW that want's to compete with SL has to do everything SL does and better and more besides. Sure it may not be growing like it was in 2006 or 2007 but from my view "on the ground" there are some good signs there if you look for them. Newbies keep coming in, oldbies are becoming more active, I'm also seeing more interest by newer folk in taking up the SL fashion blogging mantle. You may not realize this but I actually have a BM dev account, got it in September of 2009 upon the suggestion of certain Caledonians that I get in on the ground floor of "The next best thing that was going to take SL down." But I soon realized that BM wasn't the future, unless they got over their obsession with the technology of meshes and cryengine. and focused on the communication between avatars. Someone said in one of those threads that they doubted AR would ever "dumb down" the BM client for less powerful hardware.....ha ha ha ha ha. "Don't bother with BM, it's not an SL killer, it's Sony Home for the PC. Not worth your time since it's not really a beta, it's Alpha level even though they've had years to learn from other virtual worlds. I'm surprised how non-existent the social tools are." And in fact I'll probably say such things, but only if directly asked my opinion. BM needs users. Users are why VW's exist, the content creators and corporates are middle men. The "BIG DOUGH" is all well and good, but AR/BM needs users to keep that coming, the VC based on "potential" won't last forever. Sooner or later, results (with lots of actual users) will be needed." VC: The client hasn't changed much since the last time you showed it to us How is the growth..are people flocking to your cryengine powered graphics? And hows that cloud thing going. VC: No More Money. It's over. AR: Wait! We'll turn it into a mobile app! iPhone, iPad app-store buzzword mezmerize! VC. mezmerized by the buzzwords and hype over Apple's devices: Here's more money...go to it. In other words I think the move to mobile is just a cynical ploy by AR to keep the VC money coming for another year or so. As an experienced SL creator and scripter, I was intrigued by the hype about BM and I tried it briefly a few months ago. It seemed clear to me then that it was very young, very raw and needed a lot of further development. Also, the entrance barriers for content creation were too high. I'm not surprised the investors took fright (I reckon the previous poster's imagined conversation with the "VC" is about right!). The great thing about SL is how an intelligent and inquisitive newcomer can invest a relatively small amount of time and effort and learn how to build things. That said, LL have lost their way in the last couple of years, and are no longer giving priority to the needs of the people who built the world for them. Many of us are now seriously looking at other grids. I am rather confused as to why this move constitutes the failure of Blue Mars. It seems all but certain that mobile devices like the iPhone will become the primary computing device for most people (this might already be the case for all I know). So, surely, it makes a lot of sense to focus less on the PC as a platform and concentrate instead on getting a decent performance out of mobile devices? "I'd like some factual data, please; because Kzero's own data shows rather the contrary"
Gwyn, KZero's data is not very useful, because it only counts total registrations, not monthly unique actives, and primarily web-based 2.5D web worlds and MMORPGs, not 3D virtual worlds. To take one example, KZero reports that Habbo has 175M registrations. That's probably true, but in actuality, Habbo has about 16M monthly uniques. And again, it's a web-based 2.5D world, not anything like Second Life or Blue Mars. There's simply no evidence that 3D virtual worlds are growing. Linden's own charts show flat growth and negative trending. "I figure something like this happened"
CCC, I'm bound by an NDA, so I can't go into specific detail, but I can say that's probably not very close to what actually happened. "Newbies keep coming in, oldbies are becoming more active, I'm also seeing more interest by newer folk in taking up the SL fashion blogging mantle." Well, I think this could really be a good move for Blue Mars - if it had not been for the fact that as soon as they make it big, Apple will probably decide to shut them down. No one but Apple - except maybe China - could get away with applying the same kind of control - political, moral and even just to protect their own business - over internet content. At the moment, doing business on the iPhone/iTab platform - and especially to rely on it as you sole platform - is simply far too risky. Developers can never know if their next (or even their first) release will be approved. Look at how they keep Flash at bay, how Issuu was never let in, how a great number of apps have been thrown out as the companies fall in disgrace for one reason or the other, and - almost a bit frightening - how newspapers have to declare their content and views in order to get their apps approved. But good luck Blue Mars! Make sure to stay friends with Mr. Jobs. while it's true that the shifting of resources from pc desktop to ios mobile apps could be perceived as a good move (and there's a large potential, indeed, in this move). What I understand by reading the BlueMars announcement on their blog is that they will end support for PC desktop development, city developers (apart some debugging) and considering that BlueMars is not exactly a complete platform, well I think we can read the announcement in the same way of the MetaPlace announcement of last year. That's: We don't have enough traction of growth, so we will focus on different market and different products. Metaplace became a facebook gaming company and BlueMars is going to enter the mobile avatar apps scene. I wish the company will have a wonderful success, but we have to admit that BlueMars as a user generated virtual world is going to pass away. It would have made sense to launch iPhone and iPad app (and Mac support) to substain the loyalty of users and give them a way to interact on the go (with smartphones and tablets)and I appreciate that Second Life is going to work on that area, and it would have made some sense to make a streaming service on the cloud for visitors aimed at a light but "target to masses" engagement in the virtual environment. But if I abandon the support on the Desktop client to focus all my resources and team on native iphone and ipad apps, well it does mean something. And I think that it means that the company board is trying to find a way to return at least part of the investment and VCs money by exploring other revenue sources. Isn't it exactly what the Metaplace company did? So after: There, Vivaty, Metaplace and many others, The virtual world industry is going to lose an other player. Probably the best competitor, with the best potential we have ever seen for some years. At the moment, we have only two virtual worlds: Second Life and IMVU. The end of BlueMars as user generated virtual world is the failure of the possibility of building a succesful social UGC virtual worlds after the end of the hype over Second life. I wonder what will be the impact over Second Life? @ Ananda - City Devs like myself were being charged "hosting" fees, which is like land tier in Second Life. We no longer have to pay that for the full PC based cities. They are remaining online as is, and I can even update my cities. What they are stopping is software updates for the PC client. So it will remain in it's unfinished state. @ Ann - the major investor in Blue Mars was Henk Rogers, who was one of the founders, and made his fortune popularizing Tetris. They got some venture money in the last round of financing, but he contributed some of his own cash in that round too, besides all the money in the earlier work. @ Loki - Content was created externally with a 3D modeling program and an image editing program. As long as it could save to the right file format, it could be used. Set up for the graphics engine used separate programs than the user client that players have. It's a separate SDK download. @ several commenters - Blue Mars PC and Blue Mars Mobile are different applications with different target markets. The mobile will be avatar dress-up, 3d chat room, integration with social websites, and possibly casual gaming. It will NOT be a large virtual world, and it will NOT be streaming cloud rendered video. @Lamorna - I agree about the barrier to content creation. Blue Mars not only used the Cryengine for graphics, they used a modified version of the building tools Crytek made for themselves. They use those tools in-house to create their Crysis series games. They are great tools for professionals (I enjoyed using them to build my two cities), but they were definitely NOT easy and quick for newbies to start building with. Second Life will soon be adding mesh, and my tests on BM items show they import to SL unchanged. But newbies will still be able to start with prims and work their way up. Mesh in SL will just be another category of advanced content, while on Mars it was all you had. I never liked the design principles that drove the people behind Blue Mars to make it. I knew that a sole focus on graphical power cannot get you anywhere. Extropia asked about whether handhelds will become the "primary computing devive for most people." For the 18-22 year olds at my university, they are already the primary communications tool. We used to see laptops lugged to class a few years back. Now that's far less common. I'd like to know, for this US demographic that is about to earn a real income, how they use their laptops (desktops appear to be vanishing from dorm rooms, fast). And when the young people graduate, will they want virtual interactions and gaming beyond FaceBook? Will they want to interact with those whose identities are not known to them in RL? On-the-ground evidence for my students suggests "no" and "no": these proto-consumers are very augmentationist. But I don't have definitive data and would love to see academics or researchers like those at K-Zero (thanks Gwen for the link) provide some answers. This concept of flat screen "3D" is getting long in the tooth. You can buy 3D HDTV with those nerdy glasses now. I find myself wondering when real hologram technology will finally become available to consumers. I.e. ; it seems like the "next big thing" should be knocking on the door right about now. you guys all blew it... nothing but habbo hotels and pepsiworlds forever.! and those educators in OS will be the vrml 2.0 crowd.... until the university pays the flash kids in 2 years to take over all web3d initiatives. "Yes, I'm aware that people logging in to Blue Mars right now are expecting it to be a virtual world — sort of like Sony Home for the PC — and not "merely" a content creation platform, which is what it really is So perhaps some splash screens, or some information on the emails sent to beta testers, might prove useful." Iggy, let me say this even more strongly: The KZero figures are incredibly misleading and not very reliable if you're trying to analyze actual market activity. You do make a very good point that young adults are moving away from PCs towards smartphones and tablets. From that perspective I agree with Extropia that this could be a smart gamble on Blue Mars' part. For those who are taking the 50% layoff announcement as incontrovertible evidence of Blue Mars' demise, let me remind everyone that back in 2003, Linden Lab laid off 2/3rds of its staff. That was right before they changed their revenue model and started seeing incredible growth. Layoffs are not always evidence of failure, especially in the tech startup space. The numbers have changed somewhat since then, but yeah, the bottom line is the broader market then and now has been moving to web-based 2.5D worlds, but even those are eclipsed by social games. Blue Mars is yet another virtual world bit of evidence that no virtual world can survive financially if the only users they can draw is a fraction of the Second Life userbase. It's a simple bit of math, really. Blue Mars was too focused on a better-than-SL business model, which was their downfall from the start. If they are incapable of building their own userbase outside of Second Life users, they aren't capable of marketing, period. And certainly no one is going to build a world like Second Life and magically siphon all its users and then grow beyond when they can't market in the first place. If there's ever a competitor to SL, it won't be OpenSim and it won't be someone that tries to be a better Second Life. It will be a world that invents itself to be uniquely better in some way from the ground up. If you want the rest of the picture, take a look at Gartners Hype Cycle for emerging technologies for 2010 and find virtual worlds on the chart. Compare with a boom in the virtual goods industry in 2010. We've passed the point of inflated expectations and we're now at the beginning of an upward trend and Second Life should see more solid, modest and reasonable growth this year. Simple stuff if you keep it simple. As to their move to mobile, it may be the right thing. They need to go where there's a market and it's not as a Second Life contender on the PC. Mobile virtual goods are much easier to market for. At an almost $3B industry for virtual goods in 2010, it's a hot thing right now, so of course if they're going to salvage things that's where they need to be. @Paisley - "if the portible eventually becomes more powerfull". @Extie & Ignatius re "handhelds will become the primary computing device for most people." As Ignatius says, this is already the case for many young people, and I think the trend will continue. Too bad this will push the Internet of old to a little niche for geeks. Mobile will probably be the highest growing IT sector in the 10, and AR made a wise decision to be there. But stopping development of the PC client shows that BM has not been successful. I have been playing with the platform since the very early beta (I have worked on CE2 simulators and I know the platform's potential and limitations well), but I have never seen too much interest in BM. I, Extie, Ignatius, Hamlet and most readers of this blog are VR evangelists who, back in 2007, used to consider SL as the next big thing and a precursor of a future Internet a la Snowcrash. But now I am afraid we must accept that, for the vast majority of Internet users, VR worlds are just something one can do without. Thank you for pointing to Tateru's numbers...though I would like to see those in comparison to 2006, 2007, 2008, 2009. I have my suspcicions that although concurrency has dropped, that it's more stable day to day, than it was in say 2006 or 2007. When I joined "high days" could have almost 50% higher concurrency. Also, when I read that AR/BM had hired you and Iris as consultants my first reaction was: They should have done that in 2009! "this kind of triumphalism might be understandable if Second Life was still growing, but the painful fact is SL has been slowly but steadily losing active users and active user hours over the last three years"...has it, though? Let's not forget a few changes that had the effect of a reduction in apparent active users and total user hours: LL banned traffic enhancement via bots and camping. Those may have represented some significant number of active users and total user hours, but in terms of real users, they didn't. Let's take a look at Tateru Nino's charts of logins and concurrency here to see if they support what you're saying, keeping in mind when LL initiated traffic changes and banned bots and camping. Logins, last 60 days (which LL quit publishing this past October, apparently) hit a peak of near 1,800,000 over the summer of 2007, which was, not coincidentally, the crest of the SL hype wave. That number fell to 1,200,000 around summer '08 and started climbing again, falling off some (but less than expected) with the ban of "traffic enhancement" and remaining relatively stable (with fluctuations) around 1,400,000. Some percentage of this, obviously, represents logins with multiple accounts if it's by unique avatar and not by IP address. 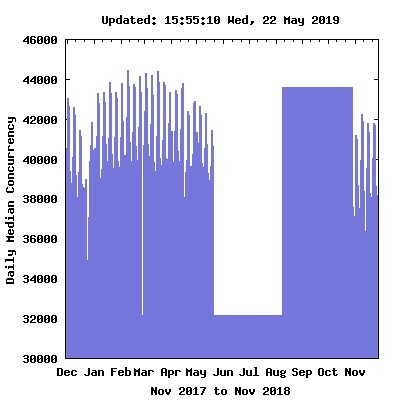 And peak SL concurrency remains on average at above 60k during the week and above 70k at weekends (which is a decline from the all-time peak of more than 88k in summer of 2008, but has remained relatively stable within that range for some time now). Blue Mars is empty because even people with broadband don't like waiting for the 4G of data to be transferred to them just to set foot in the first city. If bluemars is to be a workable VW, it has to be quickly accessible. Their current model of "everything has to be loaded first" harkens to the old days when we'd stare at the screen in anticipation of seeing the picture we were downloading from the BBS at 9600baud. That would be fine... if this was 1986. But it's not. Blue Mars needs to have a DVD with the base cities in it and everyone who rents a shop or makes their own city to extend from existing cities have their data (much smaller dataset) sent when the user is within reasonable distance. For visiting other individual sims, a "travel tube" is ridden while the data for the city is transferred. This would also help with immersion, as entering the station would show you what cities were available to travel to. But an iphone app? With the enormous datasets that Bluemars takes? Not on MY iphone, no. So... the company that would NOT make BlueMars available on the Mac is now going to develop ONLY for iOS? What gives?